The gameplay of Kingdom Hearts II is similar to the action RPG and hack and slash gameplay of the first Kingdom Hearts game, though developers made an effort to address some of the complaints with the previous game. The player directly controls Sora from a third-person camera angle, though first-person perspective is available via the button. Most of the gameplay occurs on interconnected field maps where battles take place. The game is driven by a linear progression from one story event to the next, usually told via cutscenes, though there are numerous side-quests available that provide bonuses to characters. Combat in Kingdom Hearts II is in real-time and involves heavy hack and slash elements with button presses which initiate attacks by the on-screen character. A role-playing game menu on the screen's bottom left, similar to those found in Final Fantasy games, provides other combat options such as using magic or items, summoning beings to assist in battle, or executing combination attacks with other party members. A new feature is the "Reaction Command", special enemy-specific attacks that are triggered when the player presses the button at the correct time during battle. Reaction Commands can be used to defeat regular enemies or avoid damage, and are sometimes necessary to complete a boss battle. In addition to the main character, two party members are usually present who also participate in combat. Although these characters are computer-controlled, the player is allowed to customize their behavior to a certain extent through the menu screen, such as attacking the same enemy Sora targets. Like in the first game, Sora can summon a Disney character to aid him in battle. 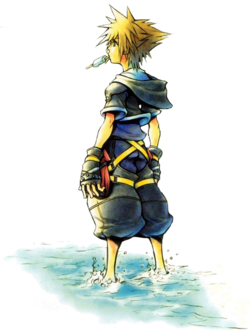 Summons will replace the two computer-controlled characters and fight alongside Sora for as long as the Drive Gauge allows, or until Sora's HP runs out. Instead of being limited to only one action, Summons now have a menu of their own and are capable of performing solo or cooperative actions with Sora. These actions are performed by pressing the button. The Summon ability and each Drive Form are leveled up separately and by different criteria; obtaining higher levels allows for extended use and in the case of Drive Forms, access to new abilities. This page was last edited on 29 September 2017, at 04:19.